I’ve worked at New York City Relief, a Hope for New York affiliate that serves men and women living on the streets, for seven years now. In that time, I have talked with countless individuals struggling with homelessness, addiction, mental health issues, and every kind of physical and emotional trauma you could imagine. Most homeless folks are dealing with trauma that the rest of us could hardly imagine, let alone empathize with. Yet, my experience tells me that if we have the courage to follow God into a space that we don’t understand or feel equipped to handle, there will always be others who meet us there to make up the difference. 2. Helping someone is not about a return on investment. After seven years of doing this work with countless failures and false starts, I think the point is simply to remember that value is defined by presence, and not by productivity. With every failed attempt to help someone get off the street, we are given the opportunity to redefine how worth is ascribed. If you think your investment is only as valuable as the return you get, you will be perpetually disappointed and you will constantly attach strings and expectations to your generosity that will drain the power out of your sacrifice. The point is that to live and love like Jesus means ascribing worth to the worthless, hope to the hopeless, and mercy to the merciless, regardless of what they do with it along the way. 3. Our homeless neighbors are not a problem to be solved. What we think about homelessness matters. If you assume every panhandler or homeless person you see is addicted to drugs or alcohol and cannot do anything but spend their money in a self-destructive manner, you will inevitably miss the opportunity of a lifetime to engage with — and learn from — the child of God who is right in front of you. Richard Galloway, one of the founders of New York City Relief, likes to say, “The poor are not a problem to be solved, but a portal to the heart of God.” After seven years of traveling in and out of that portal, I can absolutely affirm that there is nowhere on earth you will feel the presence of God more powerfully than when you’re talking to a new friend who sleeps every single night on a cardboard mattress. 4. Homelessness is not a state of being. That guy you walk past on your way to work every day is a human being who is dealing with homelessness, not a homeless being. There is a difference. In our society we are way too conditioned to associate our being with our doing. We are not what we do, and the same should be remembered about our homeless neighbors. Our society almost always considers homelessness an identity rather than a situation. This way of thinking has infected us all. We must consider the language we use and the way we talk about people in order to change the way we interact with them. As long as we think that our homeless neighbors are more “homeless” than they are “neighbors”, we will treat them like an issue to be addressed instead of person to be loved. 5. Loving our neighbors is not a cherry on top of our theological sundae. 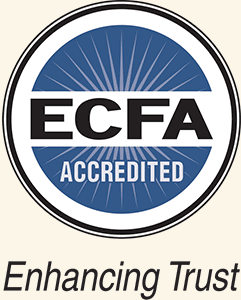 We tell volunteers all the time that one of the main priorities of our organization is to “love the person in front of you.” We also believe that the mandate of Isaiah 58 “to share your food with the hungry and to provide the poor wanderer with shelter — when you see the naked, to clothe them …” is not just an add-on to our faith. This is essential to the call of every Christian. It is a call to connect with people and point them to local resources and programs that offer food, shelter, clothing, and the chance at a new life through advocacy and rehabilitation — and to new life in and through Jesus Christ. Josiah Haken is the VP of Outreach at New York City Relief. He lives in New Jersey with his wife and two children. You can read more about him and his work with NYC Relief at thereliefbus-teamhaken.org. 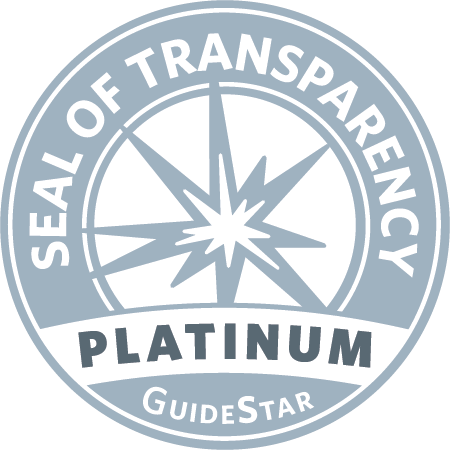 This post originally appeared in the February 2019 Redeemer Report. Perhaps you’ve donated to Helping Up Mission and other organizations, and maybe you’ve volunteered with us. These are all wonderful things – but you want to go deeper. You want to move beyond transactional interactions to real, mutual relationships with people who are materially poor. You might consider working through the course Are You A Good Neighbor? with a friend. Baltimore, MD (September 29, 2017) – Giving back to the community has always been a high priority for the Delbert Adams Construction Group (DACG). This week, DACG passed over the key to a new welcome booth to the folks at the Helping Up Mission. This booth is a parking lot icon and functions to welcome visitors. And it’s driving me out of my mind. What happened to all my plans? For years, men in the addiction recovery program at Helping Up Mission have written poetry as a part of their recovery process. Now, they have gathered, edited, and published a sampling of their writings as a book: War of Grace: Poems from the Front Lines of Recovery. This video was produced in collaboration with the amazing team at Mozell Films. But there’s good in this city! For years, men in the addiction recovery program at Helping Up Mission have written poetry as a part of their recovery process. Now, they have gathered, edited, and published a sampling of their writings as a book: War of Grace: Poems from the Front Lines of Recovery. Follow us on Instagram for snapshots of men in the process of recovery. This video highlights the recovery stories of three men, as told by their loved ones. Wayne is studying at Stratford University to become a chef. Aaron is mentoring young boys in the city through Acts4Youth. Drew is on staff here at Helping Up Mission, handling media and communications. “Defined” was produced in collaboration with Mozell Films. Join the conversation on our Facebook and Instagram pages! We partnered with Mozell Films to produce a beautiful video that captures who we are and what we do in less than 4 minutes. Enjoy and share! Today is our 2016 Graduation Banquet – one of the most memorable moments of the year for us at Helping Up Mission. We partnered with Mozell Films to produce new videos, and today we’re releasing them to the world! This video is an overview of who we are and what we do. This video highlights the recovery stories of three men – Wayne, Aaron, and Drew – as told by their loved ones. Recovering addicts give brutally honest definitions of shame, vulnerability, and hope – showing how the path from shame to hope leads through vulnerability, not around it. Many people are familiar with the first stanza of the Serenity Prayer, written by Reinhold Neibuhr. But have you heard the whole thing? We just released an ebook/audiobook collection of poems written by our men. Go to our poems page to download it for free! Here’s the story behind that obscure Latin phrase, as told by our chaplain Vic King. Have you read The Drowned Vault by ND Wilson? There’s an intriguing Latin family motto hidden in there: sic semper draconis. It’s a play on the Latin phrase sic semper tyrannis, which has a strange and storied history. 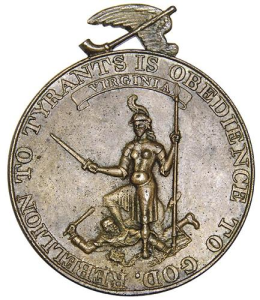 Sic semper tyrannis was the cry attributed to Brutus at his assassination of Julius Caesar, and in 1776 it was adopted as the official seal of the Commonwealth of Virginia after they declared independence from Great Britain. Several decades later John Tyler, a Virginian boy who would one day be the tenth president of the United States, led a revolt against his despotic schoolmaster. Tyler and his classmates tied the teacher hand and foot and locked him in a closet at the end of the school day. When the teacher was found and freed, he confronted John Tyler’s father, who dismissed him with the Latin phrase. John Wilkes Booth’s diary records that he hollered “Sic semper” after shooting Abraham Lincoln in April 1865, referencing Caesar’s assassination. And Timothy McVeigh, who was responsible for the Oklahoma City bombing in April 1995, was wearing a t-shirt with the Latin phrase and a picture of Lincoln. Clearly, the pedigree of the phrase sic semper tyrannis has become less noble over the centuries. But with his variation, sic semper draconis, Nate Wilson not only revives the spirit of righteous rebellion, he recovers its biblical roots. Our ultimate enemy is not an earthly tyrant, it is a hellish dragon. 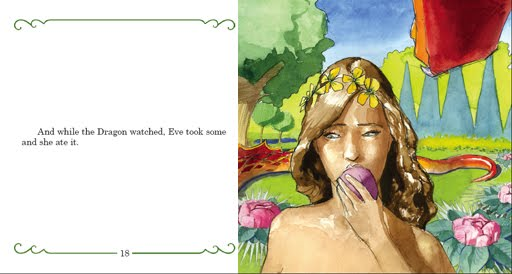 A page from ND Wilson’s picturebook account of Genesis 1-3, The Dragon and the Garden. But God doesn’t leave it at that. He promises Eve that from her line will come a dragon slayer, the Dragon Slayer, who will crush the beast and free his people from the tyranny of sin. The protoevangelium tells the serpent that “he will crush your head, and you will strike his heel.” The dragon will be trampled, but at great pain to the One who does the trampling. And the dragon stood before the woman who was about to give birth, so that when she bore her child he might devour it. The scene on the ground in Matthew 2: the tyrant Herod hears rumors that a threat to his throne has been born. That paranoid despot orders the slaughter of all the baby and toddler boys in Bethlehem. Revelation 12 gives the scene in heaven: behind the tyrant was the dragon. The devil was seeking to devour the Christ-child, but he is thwarted, and Jesus and his family escape to Egypt. At the start of Jesus’ ministry, he faces off with the dragon once again. This time, it’s alone in the desert. And again our Lord comes out unscathed. Theologians have made much of Matthew 4 as Jesus’ recapitulation of Israel’s history: Israel went into the wilderness for 40 years to be tested, and so did Jesus. But unlike Israel, Jesus never wavered. He is the new Israel, and he is the second Adam. 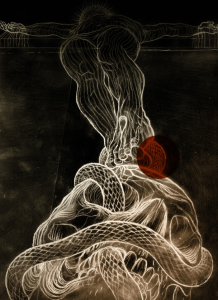 He lived the life that Adam failed to live, and died the death that Adam (and each of us) deserve, taking the serpent’s strike on the heel… but rising to life on the third day, crushing that dragon’s head. 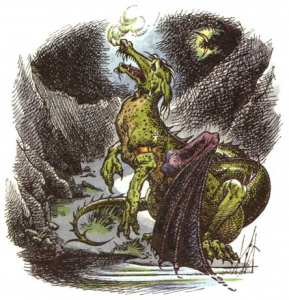 Eustace was miserable as a dragon and discovered that he was utterly unable to heal himself or prepare himself to be healed. When he tried to remove the dragon skin by himself, all he was able to do was get down underneath his dragon skin — to the next layer of dragon skin. And you know while you are reading this passage, beyond any shadow of any doubt, that as long as Eustace was doing his own scraping, it would be dragon skins all the way down. The very first tear he made was so deep that I thought it had gone right into my heart. And when he began pulling the skin off, it hurt worse than anything I’ve ever felt. The only thing that made me able to bear it was just the pleasure of feeling the stuff peel off. . . .
Well, he peeled the beastly stuff right off — just as I thought I’d done it myself the other three times, only they hadn’t hurt — and there it was lying on the grass: only ever so much thicker, and darker, and more knobbly-looking than the others had been. And there was I as smooth and soft as a peeled switch and smaller than I had been. Then he caught hold of me — I didn’t like that much for I was very tender underneath now that I’d no skin on — and threw me into the water. It smarted like anything but only for a moment. After that it became perfectly delicious and as soon as I started swimming and splashing I found that all the pain had gone from my arm. And then I saw why. I’d turned into a boy again. . . .
After a bit the lion took me out and dressed me . . . in new clothes. There it is, baptism and all: through faith in Christ, we are un-dragoned. And now, Paul tells us in Ephesians 6, we fight demonic forces with the weapons of the Spirit. We have been given the full armor of God, that we may be able to stand against the schemes of the devil. For we do not wrestle against flesh and blood, but against the rulers, against the authorities, against the cosmic powers over this present darkness, against the spiritual forces of evil in the heavenly places. In my work as a chaplain at Helping Up Mission, I see a lot of dragon-slaying. I have the privilege of walking with men as they do battle with the dragons of addiction and trauma, sins they’ve done and sins done against them, the spectres of shame and guilt that hound them like the Nazgûl, those deathly riders in Tolkein’s Lord of the Rings. I see men thrust the sword of the Spirit down the dragon’s throat and out the back of its head. I see men walking into new life with freedom from the dragons they had become, and the dragons that were pursuing them. I wanted to make that spiritual reality tangible in some way. Here’s what I came up with. 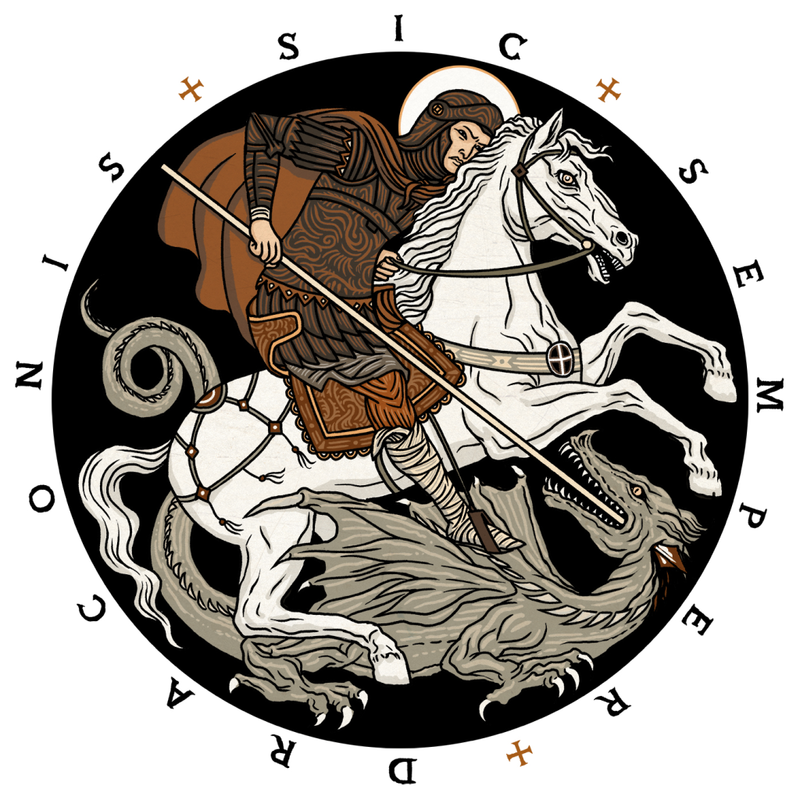 I had an image floating around in my head for awhile of an emblem: a manly fellow, somewhere between St. George and Jesus, wrapped about by a dragon as he shoves his sword or spear down its throat and out the back of its head. I reached out to Chris Koelle, an artist and printmaker in South Carolina. (Chris is perhaps best known for his epic graphic novel versions of The Book of Revelation, The History of Redemption, and Job.) He created this design, which we had printed onto 4” round stickers. Now, at Helping Up, I give these stickers to the men I counsel. The obscure Latin phrase and the powerful image have become a shorthand, an icon of their struggles and the power of Christ in them. It’s a struggle we all live with, and in Christ, it’s a fight we can win. Sic semper draconis.